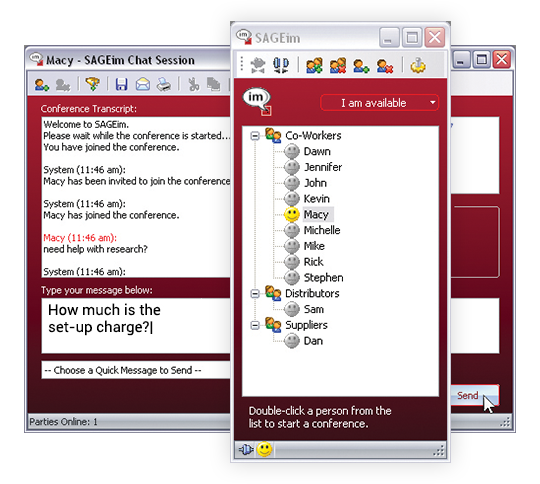 the SAGE Supplier Center, your control center. 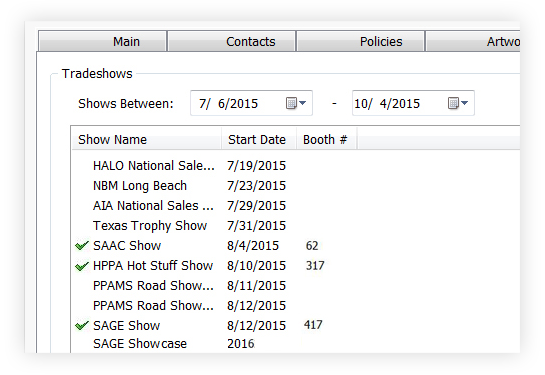 Update your company’s contact information to make sure SAGE has the correct information in their database. 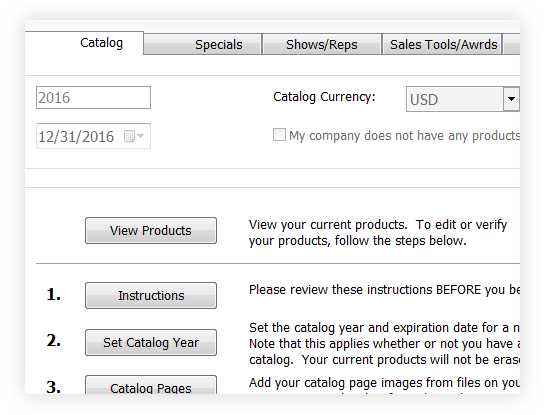 This way, each time a distributor searches for one of your products in any of the SAGE research tools, the information will all be correct. 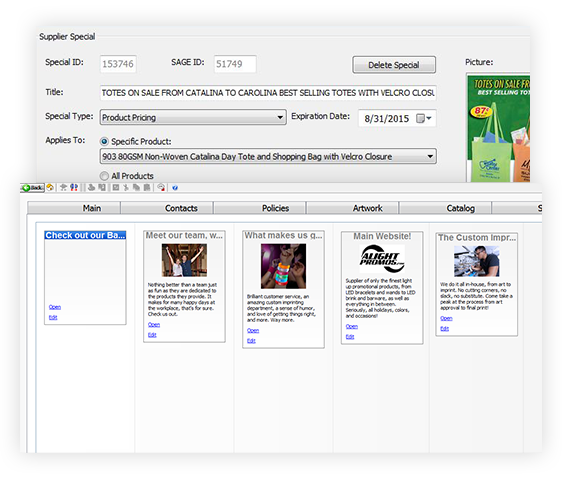 Be sure to include the email addresses you want catalog requests, sample orders, quote requests and more to be sent to. This way, every email you receive from SAGE is sent to the correct person so the process is as efficient as possible. SAGE has the only Verified by Supplier database in the industry. As a SAGE Advantage Member, you have the ability to verify your product information and pricing in the SAGE Supplier Center in real time. 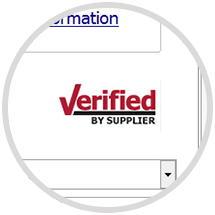 When a distributor views any of your products, they will see a "Verified by Supplier" icon to confirm the information is current. 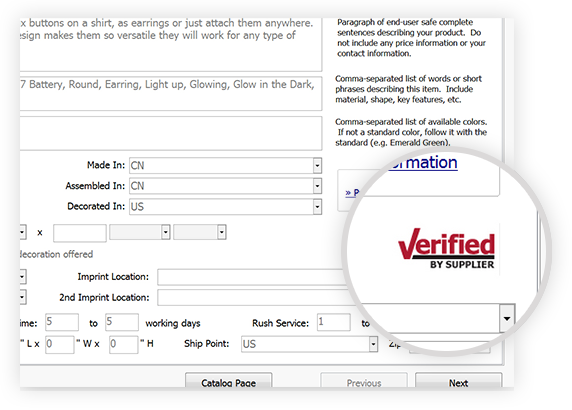 Distributors also have the ability to search only for products in SAGE Online that are "Verified by Supplier". 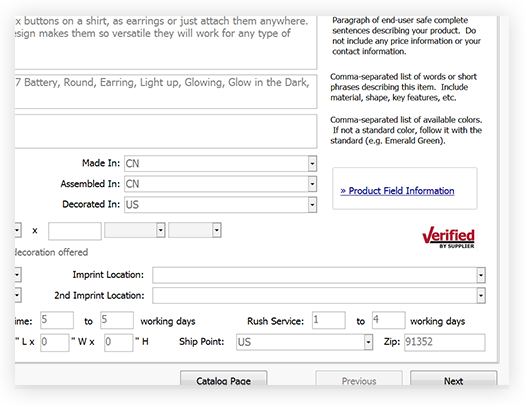 Over 85 percent of current catalogs in SAGE are verified and many distributors choose to only search for verified products. Help distributors sell more of your products! Upload multiple product images showing different colors and angles. 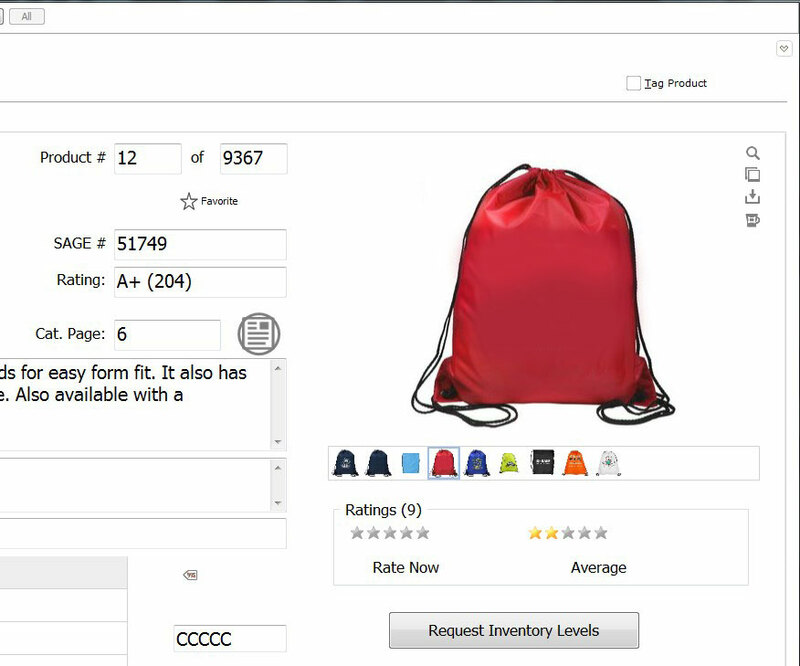 Distributors will be able to create virtual samples using their clients’ brand colors, showing them exactly what their order will look like to close the sale. 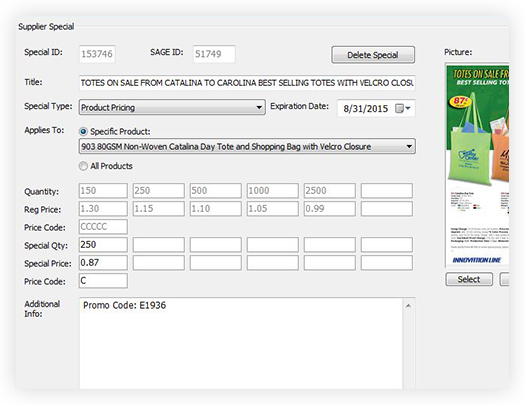 With the SAGE Supplier Center, it’s easy to add product specials and sales tools, such as marketing flyers, URLs, PowerPoint presentations, videos and more. These sales tools give distributors more information on your products to set them apart from your competitors’ products and can serve as a resource for distributors when selling your products. Distributors set alerts to be notified of product specials and also choose to search exclusively for product specials, so by adding specials, you increase the likelihood distributors will see those products. Do you ever wonder how many distributors are viewing your products? 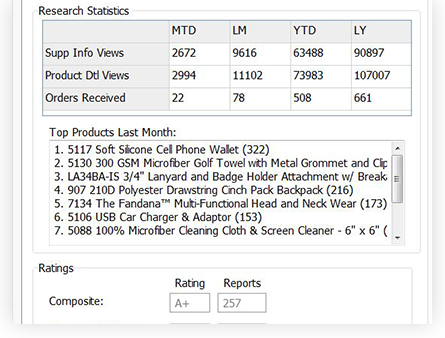 You can view your product statistics in the SAGE Supplier Center to measure how many people are viewing your supplier information and product information and how many orders you’re receiving directly from SAGE. This helps you measure your progress to see if you are improving. Providing good customer service is pivotal to retaining customers. By installing SAGEim through the SAGE Supplier Center, you give distributors live, instant access to someone at your company who can answer their questions. This is much more efficient than a phone call or email and gives distributors nearly instantaneous answers to their questions. All advertising in SAGE Online allows you to track your impressions and clicks. 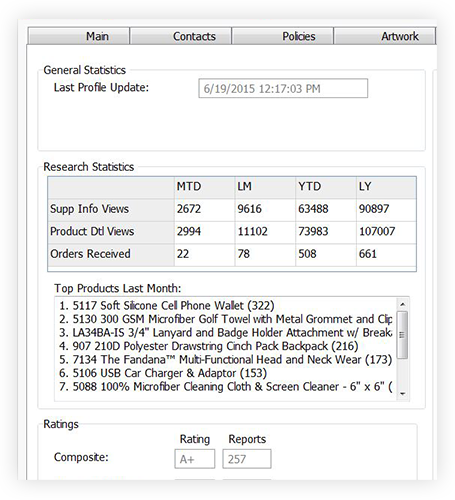 You can view these statistics in the SAGE Supplier Center. Measuring your advertising success helps you see your return on investment and what types of ads have been more effective so that you can adjust your advertising plan and put more effort into the most successful areas. 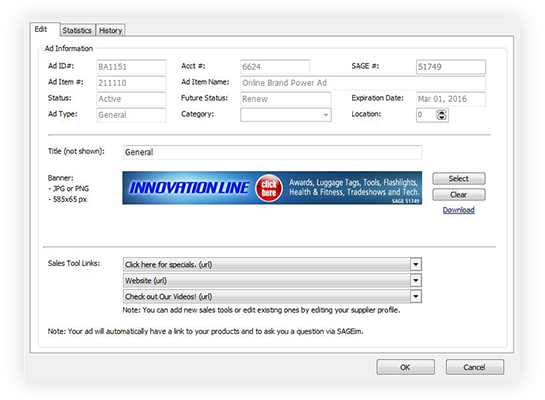 The SAGE Supplier Center is also where you will be able to set limits, have complete control of your advertising budget for pay-per-impression ads and update your artwork anytime! How many calls does your customer support staff receive each day about order status? 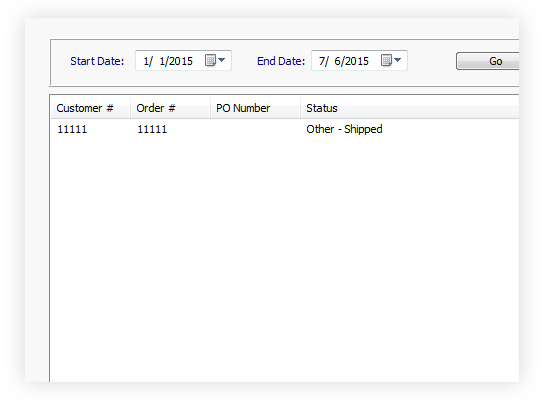 You can add order tracking information in the SAGE Supplier Center so distributors can simply check the status of their order in SAGE Online. Not only does this free up your phones and your customer support staff, but customers will also appreciate that they’re able to be proactive and get the information they need quickly, whether you’re open or not. 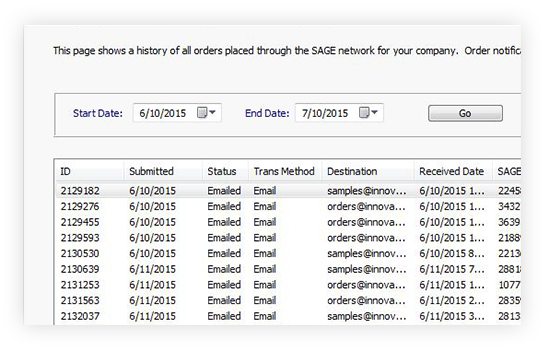 A lot of customers place repeat orders on a regular basis, so the SAGE Supplier Center makes it easy for you to quickly look up a customer’s order history if they’ve placed the order through SAGE Online, SAGE Web, or SAGE Mobile. 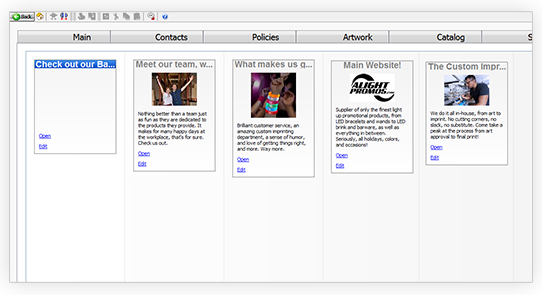 Add as many users as you like so they can log in separately to view information such as order history. 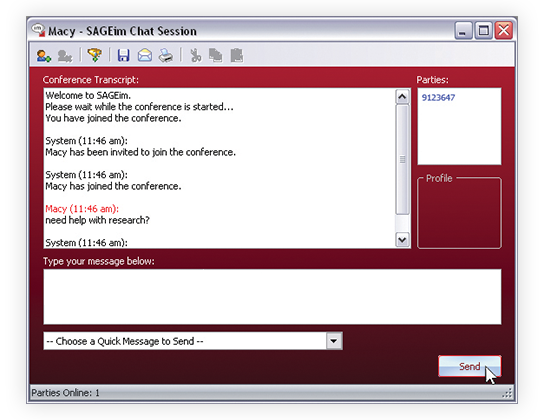 Watch a tutorial on how to add users on sagemember.com. You can add the tradeshows you will be exhibiting at and what your booth number will be so distributors can plan to meet you at a tradeshow. 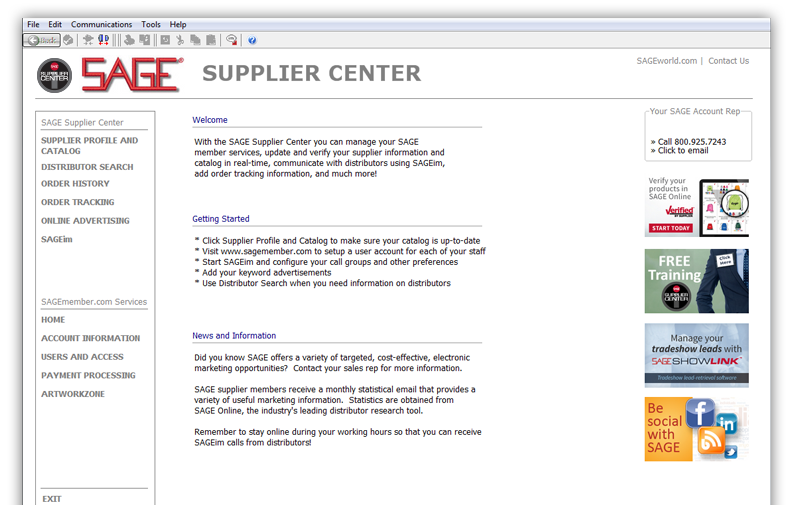 Through the SAGE Supplier Center, you will have access to nearly 90,000 distributor companies and salespeople. 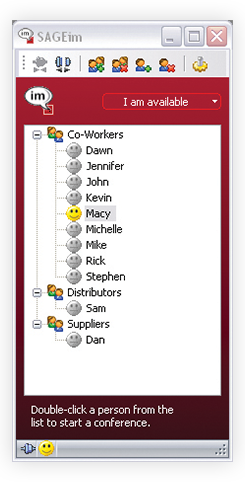 Search a number of different ways, including company name, contact name, phone or fax number, and SAGE number. 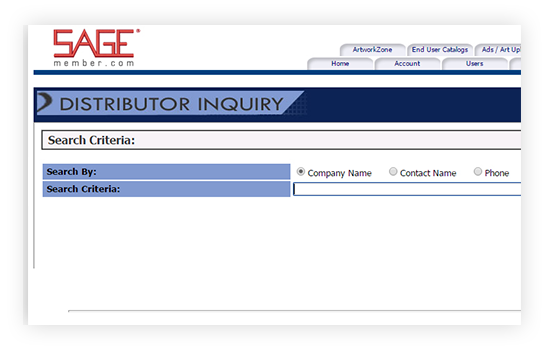 The SAGE distributor look-up is a perfect supplement to your normal distributor qualification process as well as a great tool to find current distributor contact information.